Tony Stark/Iron Man Eccentric genius, billionaire, philanthropist Tony Stark is the armored super-hero known as Iron Man. Decompressing from his heroic, near-self-sacrificial action as iron Man that saved New York City from annihilation, Tony finds himself unable to sleep and plagued by worry and trepidation. When his world is destroyed and those closest to him threatened, Tony must find a way to save them and in the process find him again. Pepper has progressed from Tony Stark's assistant to the head of Stark Industries, pausing along the way to fall in love with Tony as well. Bright, loyal and honest, Pepper understands Tony Stark more than anyone and sometimes that can be both a worrisome and dangerous thing. Colonel James "Rhodey" Rhodes / Iron Patriot Rhodey is the Liaison between Stark Industries and the U.S. Air Force. He is one of Tony Stark's few trusted friends and most of the time has the patience to deal with the impulsive genius. Rhodey has a new suit of War Machine armor in a red, silver, and blue patriotic design. When suited up, Rhodey becomes Iron Patriot. Mandarin is the sinister head of the terrorist organization known as The Ten Rings, from which all the actors of extreme terrorism plaguing the world appear to emanate. Although he is reclusive, Mandarin wields great power and makes his presence known by striking fear in the government and the populace through his brazen plans of attack. 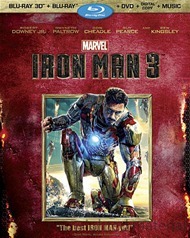 Product Description The studio that brought you Marvel�s The Avengers unleashes the best Iron Man adventure yet with this must-own, global phenomenon starring Robert Downey Jr. and Gwyneth Paltrow. When Tony Stark/Iron Man finds his entire world reduced to rubble, he must use all his ingenuity to survive, destroy his enemy and somehow protect those he loves. But a soul-searching question haunts him: Does the man make the suit� or does the suit make the man? 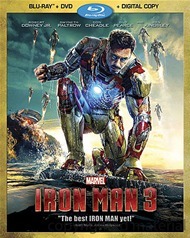 Featuring spectacular special effects, Marvel�s Iron Man 3 explodes with exclusive Blu-ray content.